Fresh food, low price grocery products, meat, snacks, digital coupons and many more good deals are available on Ralphs Weekly Ad Feb 6 - 12. Browse this ad to find Valentine's Day products, too. Gifts, treats, chocolate boxes, candies, special discounts, greeting cards and likes of these items can be seen on pg 2 of the ad. Ralphs has also a digital coupons sale. Most products will cost $1 cheaper with the digital coupons that can be redeemed up to 5 times. Digital coupons also have a corner of household supplies including Tide liquid laundry detergent, fabric softener of Downy, Dawn dish detergent and more products like those. 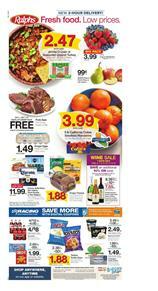 Ralphs Ad has Simple Truth and fresh produce on pg 6 where you can find trimmed tri-tip roast or steaks. Check out fresh ground beef patties, salmon fillets, almondmilk, Halo top ice cream and more fresh products, meat and seafood. Find Valentine's Day sweets of M&M's Valentine's candy, Hershey's lava cake, Ferrero Rocher heart and more.